1) Amedeo Modigliani had a tragically short life, blighted by ill health, and a rather intense alcohol addiction. 3) Looking at some of his portraits, it may seem there is a faint outline of another head in the lower part of the painting. Confused? When Modgliani first moved to Paris, he struggled financially and had little money to spare for materials. To remedy this, he sometimes used both sides of a canvas, or used the same side twice. 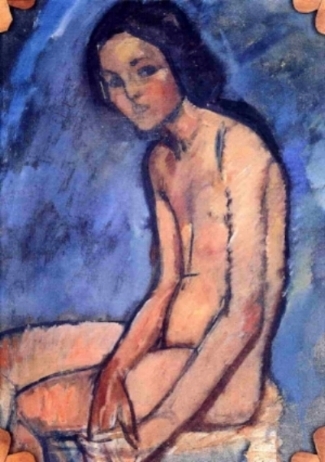 4) Talking of money troubles, Modigliani sometimes offered his paintings as payment at bars and pubs. As he never achieved much fame in his lifetime, these bartenders never accepted – a mistake they surely now regret! 5) Modigliani actually wanted to be a sculptor, and often introduced himself as such. Indeed, some of his sculpture work is stunning. 6) The pure simplicity of Amedeo Modigliani’s work has been said to make it easy to counterfeit. In 1984 some pesky students in Paris pretended they had found some of Modigliani’s work in a river. They fooled everyone, until they ‘fessed up and admitted they had forged it. 7) Modigliani worked incredibly quickly. He turned paintings round in a couple of days, or even a few hours; once he made a connection with a sitter, he liked to hold onto it, and paint while it lasted. Understandably, this whirr of activity created quite a mess of paint splattered everywhere! 9) In the exhibition at the Tate Modern, lots of clever curatorial devices are used to enhance the audience experience. Rosaline Whyte explained that one of these is the angle of the sculptures; they do not face you as you walk into the room, forcing you to walk around them, and truly experience them from all angles. This talk was delivered by Rosalind Whyte, lecturer at the Tate Modern, Tate Britain and Royal Academy. It was organised and hosted by Bell House Dulwich, as part of the commitment to wider learning for all ages and backgrounds.